Microsoft Loves Developers. This is a Microsoft marketing slogan that I have seen at conventions including Microsoft Ignite for the past few years, but until recently I didn’t realize how much Microsoft respected their developers. There is a lot of divide among the developer community with people who love Microsoft and people who do not, and this is a divide I have never quite understood. A recent project of mine has involved react-native which means I have needed to use a wide variety of tooling including Xcode from Apple. 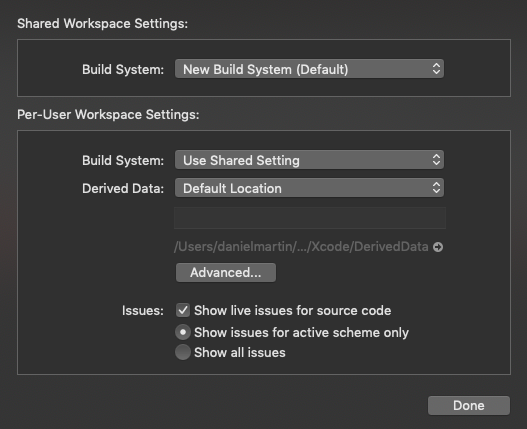 Being a developer, I think I need to have the latest and greatest all of the time so I upgraded my Xcode just as I would Visual Studio and didn’t think anything of it. After the upgrade I received a strange error during the build process of my application which indicated missing files in my build. Since the project I was developing mostly used the command line I didn’t think anything of the error since and assumed that I had done something to my project causing it to stop building. The specific error I was receiving was input file cannot be found ‘react-native/Libraries/WebSocket/libfishhook.a’, thus causing me to think it was a missing package file. With all of my years using Visual Studio and Microsoft products, I had been conditioned that if I do an update to my tooling there wouldn’t be any significant consequences. When I open a project or solution from Visual Studio that is not compatible with the version I am using, Visual Studio gives me a warning that the solution or project will be upgraded. It will warn me that it is not reversible and it will prompt me to continue. Microsoft may encourage you to use their new build options or tooling but they make sure the old one still works for some time after it is deprecated. Microsoft truly Loves Developers and there is a reason that all Developers should Love Microsoft.